OS X Lion feature Launchpad is an interesting idea. It’s meant to make it quick and easy to access all of your applications, iPad-style. But anyone who’s attempted to use it knows one simple fact: it’s cluttered and useless. Here’s how to tame it. When you first click on Launchpad, it presents you with several screenfuls of apps that represent every program you have installed on your Mac. And they’re wildly disorganized. If you have anything more than the standard apps installed on your computer, Launchpad can be so overwhelming that you’re likely to just ignore it. But Launchpad isn’t a lost cause. It just needs some wrangling. You can access Launchpad by either clicking the little silver rocket icon, or by doing a pinch gesture that uses three fingers on one end and your thumb on the other. First, you’ll want to decide what apps you want in Launchpad. Anything you don’t want on your computer at all (like maybe that weird game you don’t remember downloading and have never played) can be outright deleted, right from inside Launchpad. Click on the app’s icon and hold it down until it starts to wiggle. You can also hold down the “option” key on your keyboard to achieve this same effect. To delete an app, just click on its little “x”. You’ll get an “are you sure” message, because this will be a permanent delete. So only do this if you’re sure you want it gone for good. 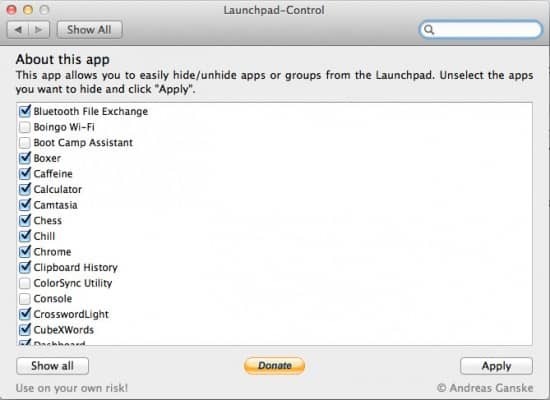 But what about apps that you don’t want to delete forever, but that you don’t need in Launchpad?Â Lion doesn’t come with any way of removing apps from Launchpad, but fortunately a fellow named Andreas Ganske has created a helpful utility called Launchpad Control that makes this easy. LC presents you with a simple checklist of everything currently showing in your Launchpad. If there’s an app you don’t want there (say, an obscure utility like ColorSync), just uncheck it and click the “Apply” button in the bottom right corner. Just like that, your unwanted app(s) disappear from Launchpad, but they’re still in Finder. Now that you’ve got Launchpad’s app list whittled down to the stuff you actually use, it’s time to get organized. This step may take some time, depending on how many apps you have installed, but it’s well worth it. 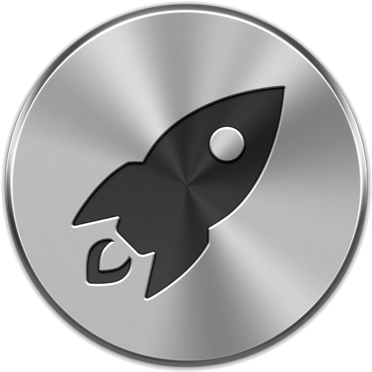 Moving apps around in Launchpad is a simple matter of drag-and-drop. I recommend organizing your apps by page. I have mine separated on three pages: apps I use daily, apps I use occasionally, and apps I almost never use (but still want easy access to). You may want to come up with your own organization scheme. 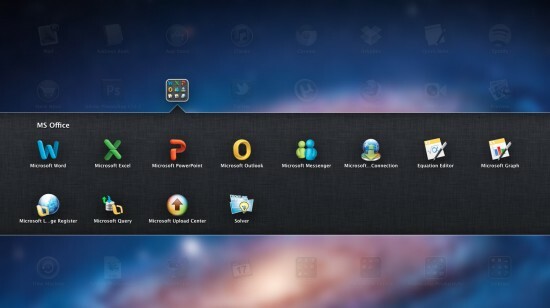 Launchpad allows for folders, just like your iPad or iPhone desktop. And it works exactly the same way: to create a Launchpad folder, inside which you can store numerous apps, just drag one app’s icon onto another. It creates the folder automatically, but you can re-name it to whatever you want by clicking on the folder’s name when it’s open. No need to download the Launchpad Control app, just create a folder for unused apps and toss anything you don’t want to see onscreen into that folder. I tried Launchpad Control based on this article and I have had problems. I have gotten some really unpredictable results: like a whole blank “page” appeared in my Launchpad after using Launchpad Control to customize things. I’ve had trouble getting my changes to “stick” after restarting, and the option to sort children A –> Z actually sorts everything A –> Z which will nuke a bunch of your work if you’ve carefully sorted your items onto different pages. I’m removing it. Maybe it was okay for prior version of the OS but with 10.8.2 it’s been worse than useless for me. I had some semblance of sorting before I installed it, and even that is now blown away. LaunchPad is USELESS. It’s a step backwards from a Grid folder in the dock. The Grid view just needs search and it’s perfect. But Grid is FAR more faster than LaunchPad for anything.